Magician Eli Marks is about to take the stage for a life-or-death performance. But it isn’t his life on the line. High school friend turned semi-famous actor Jake North is back in their Minnesota hometown to film an indie picture about an infamous magician who was killed while attempting an equally infamous trick called The Bullet Catch. “The gun would be aimed at him and fired. “The bullet would pass through the window, shattering the glass. “In that same instant Terry [the magician Jake would portray in the film] would catch the bullet. Unfortunately for magician Terry Alexander, the trick went horrible awry. He was killed. The mystery surrounding what went wrong in the final magic trick attempted by Terry Alexander is the plot of the film Jake is starring in. But he has a firm and unsettling feeling that the re-enactment of The Bullet Catch will be equally as fatal. John Gaspard has a funny, witty, and intelligent protagonist in Eli. He is, by far, the warmest and most well-rounded character on the canvas and an excellent narrator for the story. 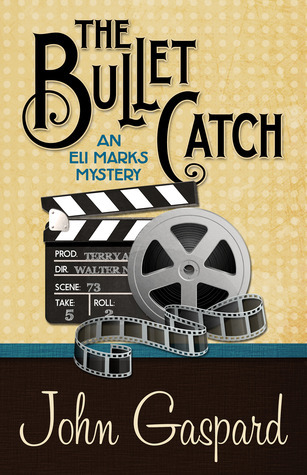 The plot is really two mysteries in one, both involving Eli and one – or more – of his high school classmates. Entertaining, but I missed a stronger sense of connection with the characters; it felt more plot-driven than character-led; aside from Eli, that is. Still, The Bullet Catch is a good read – the bonus of two mysteries in one book and the cagey and menacingly villainous figure of Mr. Lime, who lit up his every scene!